If you want to avoid such adware applications as WBSvCouponApp, you need to stay away from third party file hosting web pages and random pop-ups that appear on your browser while you browse the Internet. WBSvCouponApp is more annoying than dangerous, but it certainly puts your system at risk, especially if it displays advertisements embedded with unreliable content. You need to remove WBSvCouponApp from the PC in order to make sure you are not redirected to dangerous websites that intend to infect you with malware or steal your money. Adware applications are not computer viruses, but you should not underrate potential security risks. Based on our research, WBSvCouponApp is related to SaveNet and Saver iBox adware applications and it may come in a number of versions and variations. The program might be still the same, but its name can be generated in a many different ways. Most of the time, when the name is generated at random, the main thing that differs is the capitalization of letters (e.g. wbsvdcOUPonaPP, WbsCCOUponAPp and so on). All adware applications that have this feature are annoying and instrusive. WBSvCouponApp is developed by Open Source Developer and its homepage optonthing.info is not available at the moment. Needless to say, that there is no direct download for WBSvCouponApp, and the adware program is bundled with random freeware apps, third party installers and downloaders. You may also install WBSvCouponApp onto your computer accidentally when you click various pop-ups that offer to install media player update or Java plug-in upgrades. It shows that you have to stay away from unfamiliar websites and download software programs from official homepages ONLY. There can be no debate whether WBSvCouponApp should be allowed to remain on your computer or not. WBSvCouponApp enters your system silently, because in the event of freeware installation you are not informed about such additional programs as WBSvCouponApp. Once the application is installed it also adds extensions to Internet Explorer, Mozilla Firefox and Google Chrome web browsers. WBSvCouponApp generates commercial advertisements. It usually displays coupons and discount offers, saying that it would help you purchase the goods you want at an optimal price. However, there is no guarantee that the information provided on WBSvCouponApp ads is reliable. It is very likely that instead of allowing you to purchase something, the application would merely redirect you to another website that distributed adware and other unwanted software. It is not WBSvCouponApp’s intent, but the application could cause specific security issues by exposing you to potentially malicious content. If you want to keep your computer safe, remove WBSvCouponApp right now, and then get yourself a licensed antispyware tool that would safeguard the system from similar infections. You can also leave us a comment if you have any further questions about computer security or adware removal. Highlight WBSvCouponApp and click Uninstall. Go to Uninstall a program and remove WBSvCouponApp. 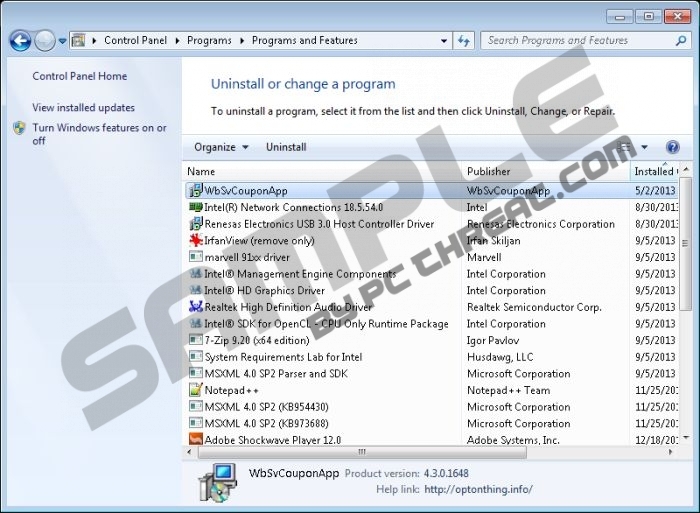 Select Add or remove programs and uninstall WBSvCouponApp. Disable and remove WBSvCouponApp from Extensions. Go to Extensions and remove WBSvCouponApp from the list. Quick & tested solution for WBSvCouponApp removal.